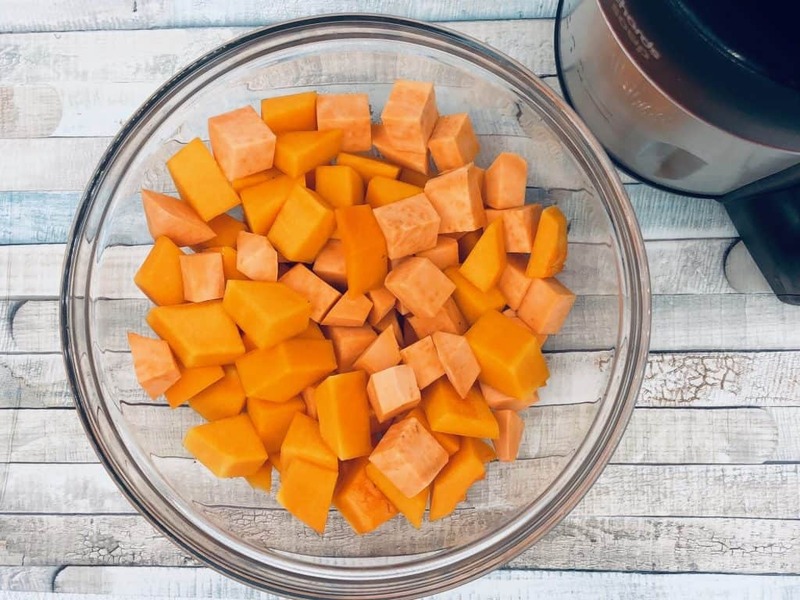 I was pretty pleased to have enough sweet potato and butternut squash chunks left over to roast up in my air fryer – I did try to squeeze them all in my soup maker, but had to admit defeat and take some out! 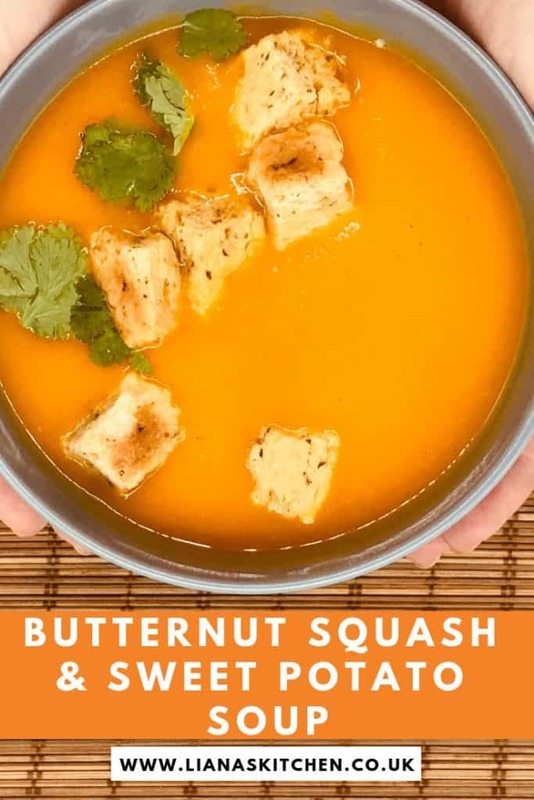 How Do You Make Butter Squash And Sweet Potato Soup? 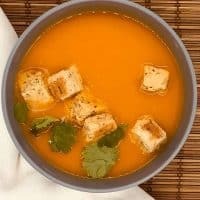 This soup comes out pretty thick, there is no need to really add in anything to thicken it up. 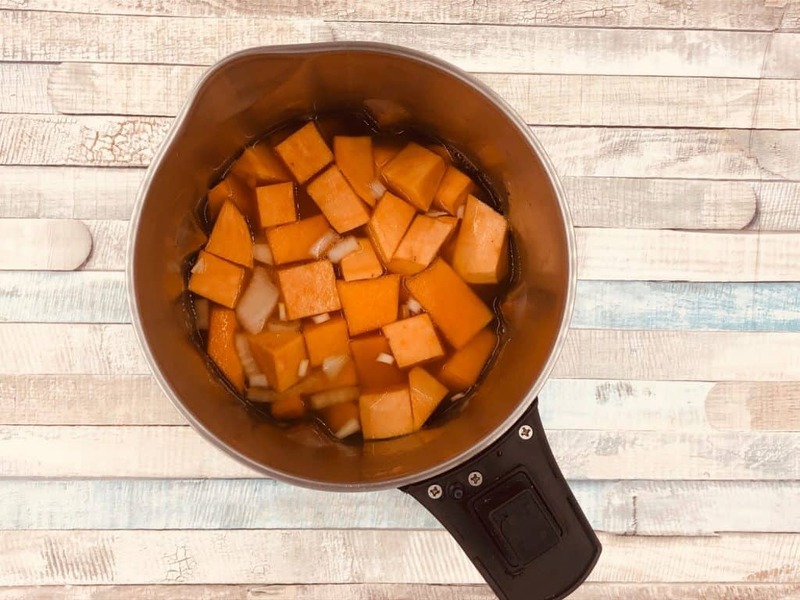 Based on a 1.6L soup maker you will likely only be able to squeeze in 400g of each sweet potato and butternut squash before it becomes a bit too much. Remember if you put too much in and not enough stock they might not cook through enough, and potentially burn the base of your soup maker – not fun. Prepare the vegetables. You can either roast the squash and potato first, or just add it in raw (see further on for roasting options). Optional: sauté the onions and garlic in a little butter or oil. Add everything to the soup maker. Ensure you are between the MIN and MAX lines. Make sure you give everything a good stir. I garnished mine with some garlic and herb croutons, as well as a little coriander. Should I Roast The Butternut Squash And Sweet Potato? Yes you can, if you have the time. Roasting them beforehand will give more flavour, but it isn’t essential. Peel and cube first, drizzle over a little oil and sprinkle some herbs on top. Cook in a preheated oven at 180C/Gas Mark 4 for about 20 to 25 minutes, or until soft. Cut the butternut squash in half, or quarters (lengthwise), and again drizzle with oil and sprinkle with herbs. You can just prick the sweet potato a few times with a fork. You will need to roast them for about twice the time as the chunks, so closer to 40 to 45 minutes. The advantage of this option is you can just scoop the flesh out afterwards rather than fussing about with peeling the skin off first. Side Note: You can eat the skin of sweet potatoes, just make sure they are well scrubbed first. I’ve never tried putting the skin in the soup maker so I can’t tell you how this will work out – if anyone does, I’d love to hear how it turns out! 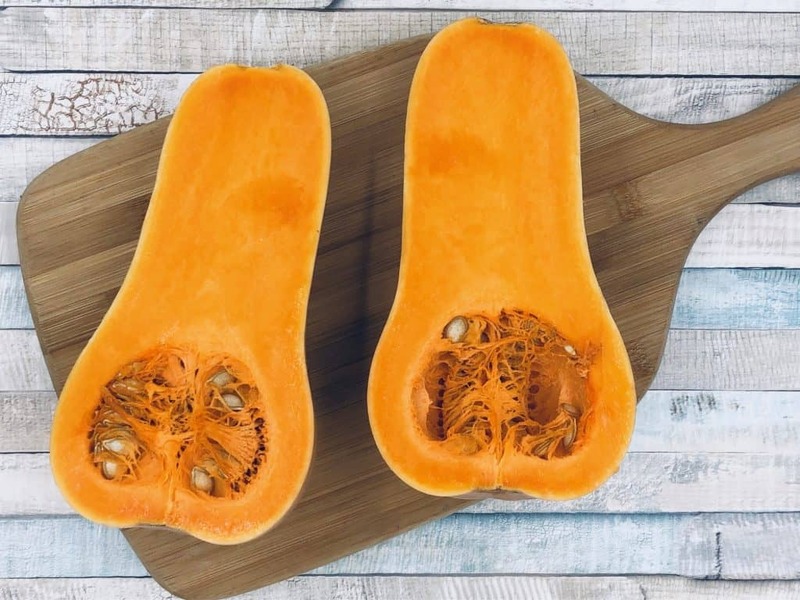 You can use this sweet potato and butternut squash soup as a base, adding in optional extras to vary the taste – it does also taste great without the extras, it’s entirely up to you and your taste buds! Spice it up with 1 to 2 tsps of chilli powder, or any spices of your choice (I used paprika). Add some herbs such as dried rosemary or thyme. Stir in a little coconut milk or yoghurt at the end. Garnish with croutons for some added crunch. 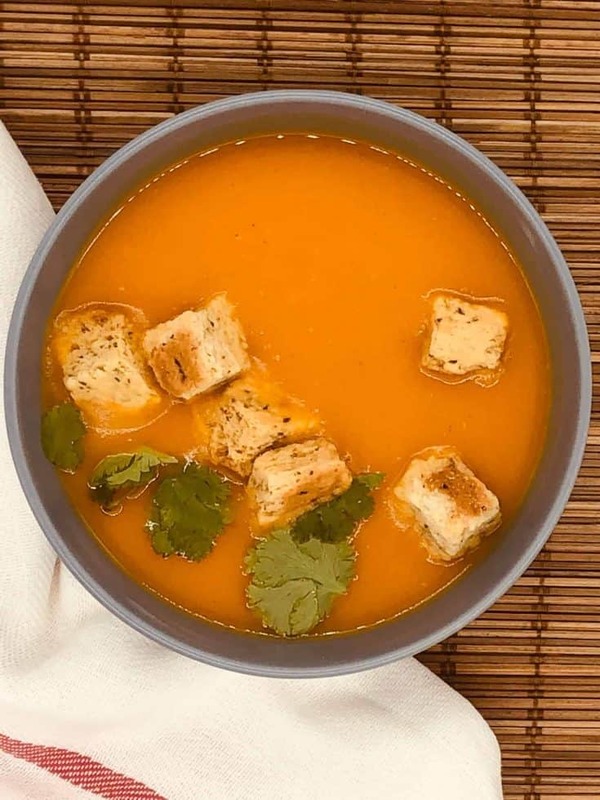 The delicioulsy comforting combination of sweet potato and butternut squash is perfect for a cold winter's day. Optional: saute onion and garlic in a little butter or oil. 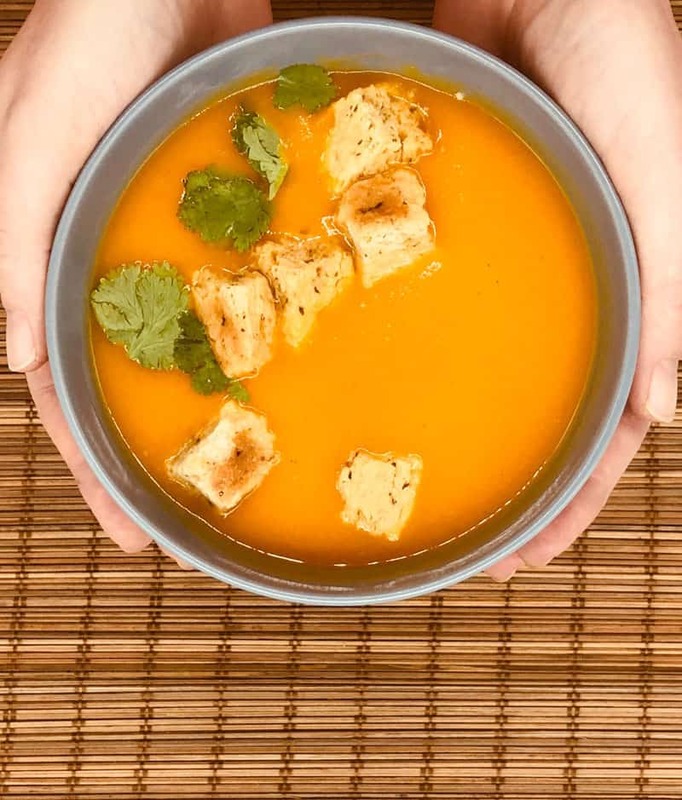 Add all the ingredients to your soup maker. Stir well to make sure no ingredients are stuck to the bottom of the soup maker. Either add the sweet potato and butternut squash raw or roast it in an oven first. Feel free to change the taste by adding in your favourites herbs or spices.